We are a Leading Manufacturer, Exporter and Supplier of Three Phase Motor, Single Phase Motor, Torque Motor, Vibrating Motor, Crane And Hoist Duty Motor, Lift Duty Motor, Cooling Tower Motor, Two Speed Motor, Single Phase Brake Motor, Brake Motor, Worm Gear Motor, Helical Gear Motor, Planetary Gear Motor, Fail Safe Brake, Bench Grinder Machine, Bench Polisher Machine, Flexible Shaft Grinder Machine, variable frequency derive, Ip 68 motor, Dual voltage, Cut Section Ac Motor, Gear Shaft, H Class Motor, Extend Shaft, Hollow Shaft Motor, Encoder Mounted Motor, Hollow Shaft Brake Motor, Center Flange Vibrating Motor, Geared Brake Motor, Dabble Flange Motor, Two Speed Gear Motor, Two Speed Geared Brake Motor, Two Speed Vibrating Motor, Force Cooling Motor Coolant Pumps etc. Amit electricals is manufacturer, Supplier and Exporter of Shaft Grinder Machine Since 1978 In brand “ATLAS”. We have a wide Experience of manufacturing. Number of Satisfied Client associated with Us Since 1978. One of the trusted Name in Shaft Grinder Machine Manufacture. We are also manufacturing Bench Grinder Machine and Bench Polisher Machine. 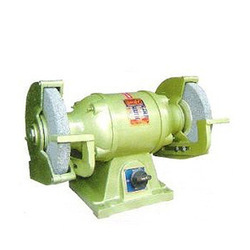 We are having wide Product Range in Production in Shaft Grinder Machine. 0.5 H.P. To 2 H.P. . (0.18 Kw. To 1.5 Kw.) Single Phase Shaft Grinder Machine suitable for 215 ± 5% volts 50 HZ ± 3%. we are also able to Supply motor in 110 volts on HZ 60 Also. Shaft Grinder Machines are supplied in a robust, rugged cast iron Body. Body is of high-grade cast iron and bolls are designed to assure ample clearance for grinding odd shaped items end long stock. Shaft Grinder Machines Shaft are Made from high carbon steel to provide exceptional Strength & rigidity to minimize deflection. Rotors are of high-pressure E.C. Grad aluminum die-cast. Every rotor is dynamically balanced. Its make motor low amplitudes of Vibration & noise. We are supply Shaft Grinder Machine with Ingress protection 44. All Grinder machine Winding insulated with class ‘B’ insulation as a safe guard against high temperature rise. In higher horsepower grinders are protected with insulated with class ‘F’. Fully impregnated with high grade insulating varnish for tropical climate. Shaft Grinder Machines are Design for Working Continuous (S1) rated to comply with performance standards. Deep grooved with sufficient lubricant, double sealed to prevent entry of any kind dust or other partial Matter inside the bearings. Three phase Standard motor Supply with Enclosure T.E.F.C. (Totally Enclosed Fan Cooling). Shaft Grinder Machines are Use in Number of application Like Workshop, Machine tools, Steel Industries, Workshop, Rubber industries, Plastic Industries, Ect. Looking for Shaft Grinder Machines ?